3 Bedroom Terraced House For Sale in Southam for Guide Price £385,000. Constructed of Ironstone Ashlar and situated within an enviable rural setting a beautifully presented Grade II Listed cottage. Offering a wealth of character features over three floors, the property has been renovated in recent years to maximise the living space and bring the convenience of modern day living and character features together in this unusual quintessential village home. The sitting room offers a brick fireplace with a multi fuel burning stove inset, stone mullion windows, exposed ceiling beams and stairs that rise to the first floor with a modern twist, a glass panel balustrade maximising the light within the room. The kitchen offers a range of eye and base level units with integral appliances that include a 4 ring electric hob with oven below, integral dishwasher & washing machine. Throughout the sitting room and kitchen area there is underfloor heating beneath engineered Oak flooring. An inner lobby gives access to the rear courtyard garden and stairs lead to the first floor where there are two double bedrooms and a shower room both with ceiling beams. The master bedroom is situated on the second floor with exposed roof trusses and access through to the ensuite bathroom. Avon Dassett is located to the northwest of Banbury, gives easy access to Jct 11 (M40), Oxford (23 miles), Birmingham (43 miles) and London (78 miles). Within the village there is the Avon public house, a small post office & secondary schooling available in Kineton. There are trains from Banbury to London Marylebone (under an hour), Birmingham Snow Hill (55 mins) & Oxford City Centre (under 20 mins). 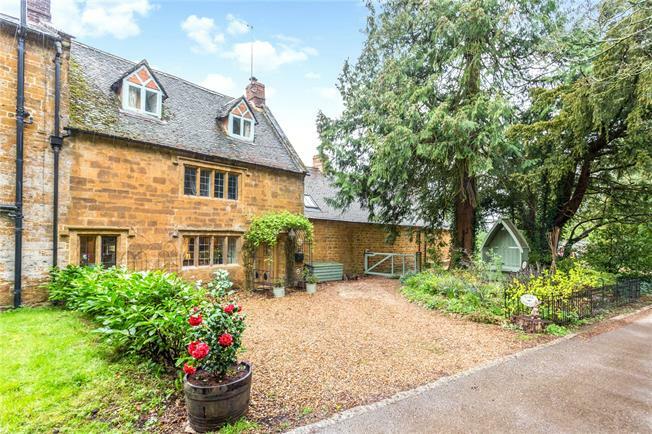 Surrounding areas of interest include Burton Dasett Country Park, Soho Farmhouse & the Cotswolds town of Chipping Norton approx 15 minutes away, Stratford Upon Avon, Warwick, Leamington Spa & Oxford. The front garden offers a tranquil haven with a beautifully landscaped area with seating and well stocked perennial flower and shrubs. With established large trees surrounding, there is parking to the front and the rear courtyard offers a lovely terrace for entertaining, enclosed by fencing and stone wall. The garden has artificial lawn with a pathway to a large store where the combi boiler and oil tank are situated. A pedestrian gate gives access to Park Close and further access to the local public house. Oil fired central heating, Dating from 1742 the property is Grade II Listed and situated within a conservation area. The property was completely renovated in 2012.